One of the most important aspects of any cloud migration is selecting a cloud services provider. 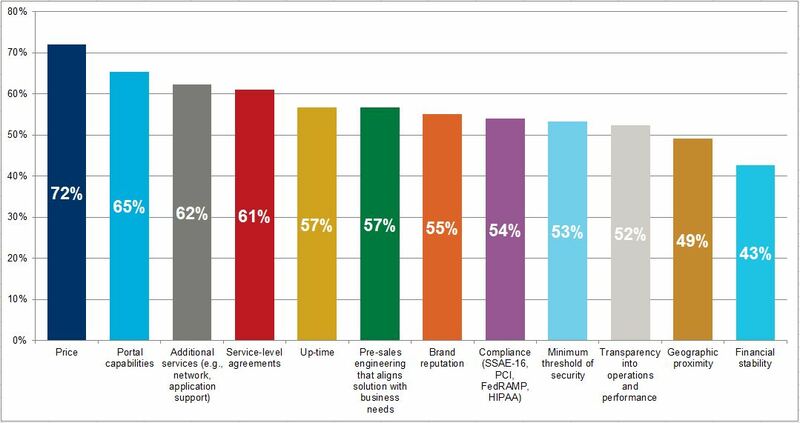 As you can see in the chart below, our survey respondents are most concerned about price when it comes to their providers. But respondents in some industries surveyed—especially professional and financial services firms—have slightly different priorities. The top pick for financial services is service-level agreements (69%), while professional services firms ranked pre-sales engineering as top pick. Perhaps unsurprisingly, given the nature of their business, healthcare respondents are significantly more likely to rank compliance as a top quality (67%); meanwhile, professional services firms are significantly more likely to rank transparency into operations and performance (62%), whereas transparency is less important to financial services (43%). The takeaway for providers? It makes sense to tailor offerings and solutions to different industries. This entry was posted in News and Analysis and tagged cloud, cloud providers, Migration by Ben Wright. Bookmark the permalink.